In the aftermath of Vasyl Lomachenko adding to his reputation as the pound-for-pound baddest man on the planet with a devastating knockout of Anthony Crolla on Friday, ESPN boxing analyst Teddy Atlas and boxing’s most enduring kingmaker, promoter Bob Arum of Top Rank Boxing, weighed in on the possibility of Lomachenko facing Mikey Garcia in the future. 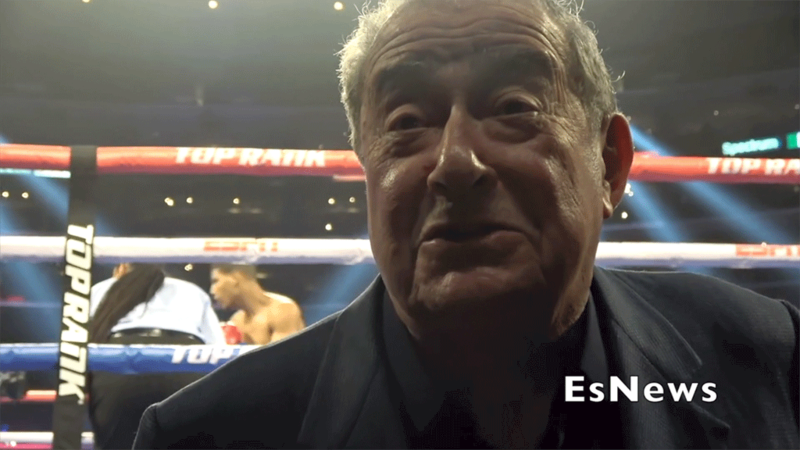 At the same time Atlas was questioning whether Garcia would be worth Lomachenko’s time, the man most responsible for deciding who the Ukrainian fights next, Arum, was holding court with reporters ringside. When presented the possibility of a Lomachenko-Garcia fight by Fox Sports Boxing Insider Mike Coppinger, Arum never hesitated in endorsing the prospect while also colorfully dismissing the possibility that “bad blood” between Garcia and Arum’s Top Rank organization might nix such a matchup. “F— bad blood! What, are you nuts? Bad blood is for you writers. “For me, I’m a promoter, it’s (all about) the Benjamins for christ sake! “It’s a big fight, it’s a fight everybody wants.